When it comes to Nutrition, we all know that the #1 way to “officially” tell if your nutrition is working for you is IF you see the results that you desire, whether be it fat loss, weight loss, muscle gain, greater energy etc. However, as a Nutrition coach, I often have to help my clients curb their desire to “see results at all costs” in order to see their METABOLIC symptoms are in tip-top shape FIRST and foremost. The reason why these metabolic factors are so imperative is that they will help you not only see the results you desire, but help you KEEP the results that you get. Going about things with the “dieter's mentality” of cutting calories and increasing exercises to the greatest lengths your willpower can muster might get you quick results, but those results almost always will come right on back to square one, and your metabolism will take a hit when it happens. As they say, slow and steady wins the race and these 4 metabolic symptoms are how I coach all my clients to monitor their metabolism to ensure that they are BOOSTING their metabolism while going after some body or composition changes. And, by the way, don’t just take my word for it, I received these great ideas from the genius platforms of Dr. Jade Teta, of Metabolic Effect as well as Dr. Brooke Kalanick of Girls Gone Strong. 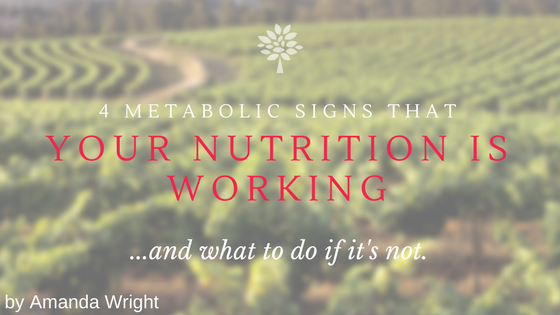 So, as you are implementing your nutrition plan, whether it be something like my Nutrient Based Eating program or something else you’re trying, there are 4 MAJOR SYMPTOMS that help indicate that your metabolism is in “check” as Dr. Jade would say. The acronym I use is H.E.C.D. You should be experiencing hunger about every 3-5 hours during the day and should be able to go over an extended period of time, I recommend 12-hours, at night without eating. If you are NOT experiencing this regulated hunger, there might be a couple things going on. First, you could simply be used to going without eating and your body adapted to this circadian rhythm. While intermittent fasting has certainly shown to work for some people, it doesn’t mean you should stick with that for ever. In fact, changing up you meal timing might be a way to get a nice metabolic boost! Maybe for a season, you would try eating from 8am to 8pm. Give your body time to adjust, and see if you don’t get more regulated hunger. If you are hungry ALL the time, this is a sign that your hunger hormones might be a little off. You would want to play around with meal sizes. Are you getting real meals, or are you snacking? Are you getting enough water, protein, and fiber from whole sources? Those are the places to start there. Your food should serve as FUEL and give you a subtle rush of energy. You should experience normal energy highs and lows according to your Circadian Rhythms. Most people peak at 10am, for example. With your food, you want to feel energized more and less lethargic and sleepy. If you are off in your sleeping habits and energy, this is an indicator that your hormones may be off as well. Investigating adrenal symptoms with this article might be good. If you always feel tired after eating, you need to play around with your food choices and perhaps quantity too. Sugar and high glycemic foods will always give you a “rush” of energy and then a crash shortly thereafter. But a protein rich, vegetable, and smaller portion of starchy complex carbohydrates (a la NBE) might be a great combination to get a nice boost! It should be noted, that non-nutrition related factors like movement, exercise, and stress will also impact this symptom as well! While you’ll never fully get rid of you desire for sugar in some ways, whether it be the sweet form or the fried and crunchy form, but your cravings should be minimized and manageable. If your nutrition meets all your needs, your cravings should be reduced. But if you have super high cravings, this might be a sign you’ve cut your diet too drastically. If you eliminated all sugar, all alcohol, and all processed foods and are trying to white knuckle it on a low-carb vegetable and protein diet or supplement resources, well, this plan is not going to be sustainable. Sure, cutting DOWN on sugar, alcohol, and processed foods is 100% the way to boost your metabolism and see fat loss. But you simply need to be mindful of how MUCH you are cutting all at once. I recommend you focus on taking the “Next Best Step” approach to a nutrition habit. Just make ONE change and monitor that you are consistent with that change at least 80% of the time (so not even perfectly!). Stick with this ONE habit for at least 2-weeks as assess whether you’re ready to add on another habit in addition, or stick with this consistency of this habit for another two-weeks. Realistically, it will take some of the more challenging habits a full 63-days for you to implement consistently before that habit becomes automated. True body hunger is something you feel in your body as a slowly building sensation from your body or belly. A craving is something you sense primarily in your mouth and brain. You just “feel” like eating something sweet. Your mouth waters, you see something right in front of you, or something just “popped into your head” and you decide you want it. Cravings are created from biochemical habit loops in our brain. The sugar, fat, salt, or alcohol craving is something that our brain once enjoyed because it came with a host of “happy” neurotransmitters like serotonin and dopamine. This is what makes them addictive, but not absolute. Your nutrition should allow you to have a daily bowel movement and proper digestion of food. If you are not experiencing a daily BM or have pain or discomfort there a few things to consider. One, you can expect that eating more vegetables will give you some bloating and gas while your body helps build up more digestive enzymes to help break them down. You can aid in this process by taking a supplemental form of digestive enzymes or taking HCl, which is what stomach acid consists of. This usually helps. Digestion issues may also be an indicator of not getting enough foods with the “good bacteria.” You can eat foods with more pre- and probiotic content, things like fermented sauerkraut, some yogurts, and kefir. Or, invest is a high quality supplemental probiotic too. Overall, fiber content is incredibly important. You will get the most fiber from whole food sources like vegetables, some fruits, and whole grains. Women should shoot for 25+ grams per day broken up throughout the day. Grab Your Free Nutrient Guide Today! Ready to SUPERCHARGE your nutrition in 2017? 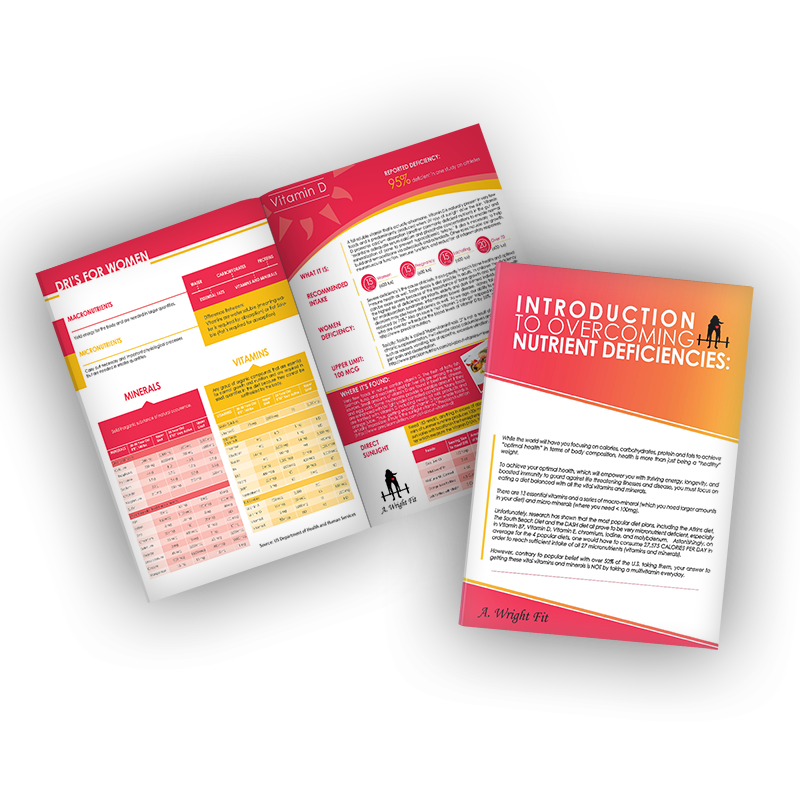 Get this FREE guide of the TOP 10 NUTRIENT DEFICIENCIES AND WHERE TO FIND THEM FOR LESS CALORIES. Studies are showing that some of the most common weight loss diets are also the least nutrient sufficient in the vital vitamins and minerals! Other studies also show that multivitamins are NOT the answer, as huge metadata results indicate they are associated with higher mortality rates! My FREE guide not only gives you where to find these most common deficient vitamins and minerals, but also gives you the serving size and nutrition data to help you get the least amount of calories per food choice! I even put all the information together into 2 days of menus that ensures you can get all the vitamins and minerals for UNDER 1700 calories!